Favorite position: Once upon a time I thought I will be a jammer but then I experienced the beauty of blocking. Since then there is no way back! BLOCKER! What’s your speciality: Being loud and low and quick and crazy and of course bitchy. How did you pick your Derby name: It all started with a little girl’s first favorite song called „Looking for Freedom“. Waiting in front of the TV she always watched a show called „Wurlitzer“ hoping that they would play this one song just for her. The obsession continued with countless episodes of Knight Rider and Baywatch. The time to face her Derby name destiny finally arrived at a VRD party in Eve the Chief’s lovely flat. A portrait of the beloved idol hanging on the wall in the living room in combination with alcohol and a crazy bunch of girls lead to the inevitable: there has always been only one real option for her…long live the Bitchy! 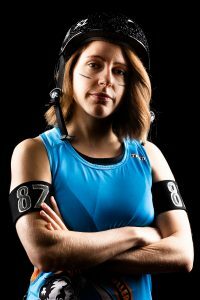 Derby crush (who inspires you and why): The Love Pack! VRD Coaches! VRD Skaters!